On Stage with Tim & Pat Curran and special guests Mike Rashid, Corey Calliet & Breon Ansley…more to be announced! On the Business & BS Podcast, brothers Pat & Tim Curran chat about growing their business (CurranMedia.co & OurCityCoffee.com) while they talk to others growing theirs. From influencers and startups to well established companies every individual has a unique story. We often chat best decisions, biggest mistakes, and hopefully have some laughs along the way. 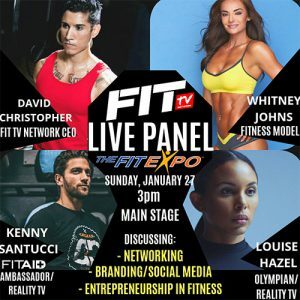 We’re excited to see where the convo goes at TheFitExpo with special guests. Secret Transformative Tips from Top Trainers! FitTV presents “Talking Fit:Networking, Rebranding & Entrepreneurship in the Fitness Industry” LIVE PODCAST with Special Guests!